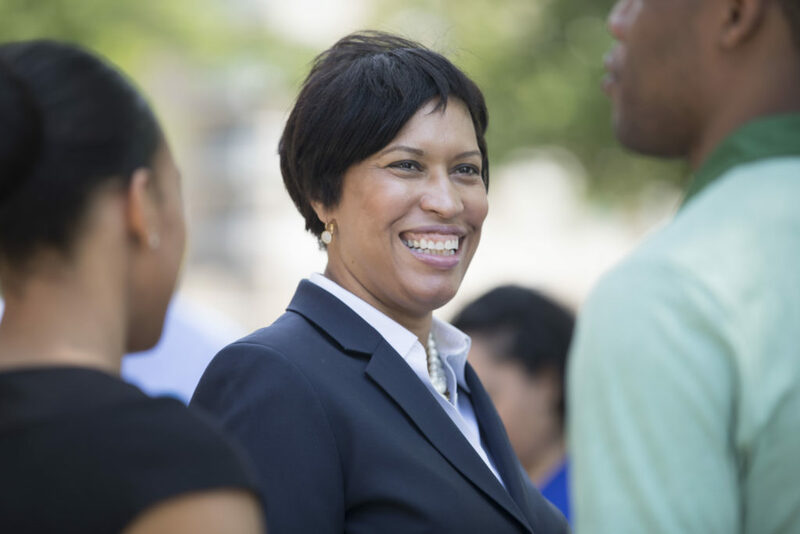 As she begins her second term as mayor of D.C., Muriel Bowser has a lot on her plate, from the partial federal government shutdown’s impact on the District to rising rates of homicide and traffic fatalities. Mayor Bowser joins us in studio for the full hour to discuss what she sees as her most significant priorities and challenges for her next four years in office. KOJO NNAMDIFrom WAMU 88.5 at American University in Washington, welcome, to the Politics Hour starring Tom Sherwood, I'm Kojo Nnamdi. Tom Sherwood is our Resident Analyst. He's a contributing writer for Washington City Paper. Tom, good to see you again. TOM SHERWOODI'm happy to be here. Thanks. NNAMDIOur guest today is none other than the mayor of Washington D.C., Muriel Bowser. Mayor Bowser, thank you so much for joining us. MURIEL BOWSERKojo, thank you. It's my pleasure to be here. Happy New Year to you. NNAMDIHappy New Year to you. And we gave out the number so if you have questions or comments for the mayor, you can start calling now. You can also go to our website kojoshow.org. Watch the live video stream of this broadcast. Tom Sherwood. SHERWOODMayor, welcome to the program. SHERWOODAppreciate it. There's so many things to talk about. SHERWOODBut we have some breaking news on two matters. Our understanding is that you have -- are going to allow to go into effect without your signature the pay to play legislation that the Council passed that would limit contributions to political people from government contractors or people seeking government contracting. I understand the deadline was 5:30 last night. Is that correct that this is going to go into effect without your signature? BOWSERThe Council moved the piece of finance legislation that I didn't sign yesterday. We've talked about campaign finance reform. I think every time I've ever talked to you here at The Kojo Nnamdi Show. SHERWOODRight. You created the BEGA, the ethics board. BOWSERYes. And I think you know kind of my general views on campaign finance. And that is that I highly value how candidates disclose. I highly value that we have a simple process that everybody understands. And we have had a number of campaign finance changes over the years, including having publicly financed campaigns that are supported and funded in a recent budget and ways to make sure that we have a fair system. BOWSERI don't think the Council landed in the right place. I think it's confusing in a lot of ways and there may be opportunities to fix some of the things that I think are problematic. BOWSERThe anti -- the Naloxone. BOWSERI know. It's kind of a tongue twister. SHERWOODRight. But how will you roll that out? You just -- everyone is going to start carrying it? BOWSERWell, let me just say, first of all, that we want as many people as possible to take advantage of all of the programs and services that we have in place to deal with the opioid epidemic and come in for treatment. And there are many different ways that we are trying to meet people where they are so that they are getting the treatment that they need. Our fire and the emergency management service has been carrying naloxone and have it available on scenes when they're called. BOWSERAnd now we want to also put it in the hands of our police officers. So our Department of Health will make a big procurement of the drug. We will train our officers and we will phase the deployment. We'll try to get it in the hardest hit areas first. And we will make sure that they are in all of our police cars and in the hands of our officers who are on foot. NNAMDIWell, one of the things we do not want to do is have our Maryland and Virginia listeners think that we are not thinking about them. And one of the things we'll be asking the Mayor about later is about her relationship with the Council. NNAMDIBut I wanted to talk a little bit about Governor Hogan, who also won re-election in Maryland as a Republican. And in his inaugural address he seemed to be suggesting A that's he's really good at reaching across the aisle at the opposition and B that apparently he's thinking maybe -- he didn't say this, but I inferred it. He may thinking of running for, well, higher office. He had former Montgomery County Executive Isiah Leggit, a democrat as one of the people who spoke at his inaugral. SHERWOODWell, Ike Leggit welcomed the people there to Annapolis. I watched the governor's inaugural address out in the cold. He mercifully did not talk too long. It was only 18 minutes. But, you know, he won, he has a 70 percent approval rating. The mayor would appreciate that. That's kind of what she has here in the city. He has -- despite tough tough battles with the democratic legislature in Annapolis he has governed in the middle. He's avoided President Trump and all the silliness and foolishness that has come along with that presidency. SHERWOODHe has said the republican way forward is moderation and cooperation not enemies and not foolishness. He's opposed the president on any number of things. And he says Maryland is flourishing in spite of what's happening. Now there are some modern conservative republicans, who see him as the kind of person that the party needs to move toward in all the state elections and maybe in the 2020 presidential campaign. Will Governor Hogan run for president? My general feeling is I think that's probably not going to happen. I think he loves being Governor of Maryland. SHERWOODWell, he didn't say he wouldn't. NNAMDIHe didn't say he wouldn't either, but so he is. He's going to be challenging democrat Phyllis Randall for chair of the Loudoun County Board of Supervisors in November. We should mention that Randall is the Loudoun's first African American Board Chair. She was elected in 2015. SHERWOODRight. Sitting right down the front row. NNAMDIAlong with the Prince George's County Executive. BOWSERWith the Prince George's County Executive, the Deputy, the Lieutenant Governor for Virginia. And so we have and we do have now -- I don't live in Virginia or Maryland and I don't vote for republicans. But we look forward to working with all the leaders around the region for what's good for the region. SHERWOODAnd if John Whitbeck, who has been on this show a number of times and he resigned as the state party chairman, he could not stomach the Corey Stewart aspects of the party. And he now is trying in Loudoun County. NNAMDIBy the way, Corey has said, I'm done here. SHERWOODWell, he says he's not going to run again for any foreseeable future or unless something changes. NNAMDIIf you change your mind, let us know, Corey. SHERWOODThe state's changing. Now Phyllis Randall did win in 2015. But she won in a three way split. She only got 30 something percent of the vote. Loudoun County as much as it's changing is still -- the non-member board is -- I think there's six republicans. But John Whitbeck is again, just like Governor Hogan in Maryland, is a moderate traditional republican conservative who says you can't get lost on social issues. You've got to just make the trains run on time, fix the roads. Do all those types of things. That he will not be a partisan hack when he runs to be the supervisor. SHERWOODSo that's going to be interesting. This could be part of the Virginia Republican Party waking up to the fact that they have put themselves in a smaller and smaller hole in that state. SHERWOODYou know, one thing we didn't talk about for Governor Hogan just very briefly. SHERWOODHe did his budget. And one of the things he meant to include is a three percent statewide raise for state employees, several hundred million dollars more in education, more money in case the Kirwan report comes back next year. And so it was a very -- not progressive, but it was a very middle of the road strong opening shot for the Maryland legislature and I meant to include that when talked about it earlier. NNAMDINot very conservative. We'll talk about education also with Mayor Bowser. You gave your second term outlook address this week where you said you'd consider what you called creative solutions to some of the city's toughest problems including the achievement gap, shortage of affordable housing, traffic issues. How do you want your second term to be different? BOWSERWell, first of all, we're very grateful to the people of Washington D.C. for giving us a second opportunity. I follow Marion Barry and Tony Williams in taking the oath for mayor a second time. And I take that responsibility that we have now and the opportunity that we have now very seriously, Kojo. BOWSERIn many ways, we are -- these are the best of financial times in our city, which gives us the opportunity to do somethings bigger and to be bold in our thinking. And a second term really represents an opportunity to build on the things that we've learned and do them faster and bigger. So on Monday we gathered as we have for the four previous years at Gallaudet University. We give a report. SHERWOODWell, technically it was Tuesday, because of the snow. SHERWOODA very good turnout, though. BOWSERIt always is because people want to hear what we've done the previous year. This time we got to talk about the previous term and the next. So my challenge not just to the people there, but to all Washingtonians, to stakeholders, to voters, is how can we think about our work and think bigger than our own parochial interests, our own ward interests, our own special interests. BOWSERAnd think about the District of Columbia as a whole. That was our approach to closing D.C. General, that homelessness. If we're going to end family homelessness and homelessness among all individuals, every ward of the city has to be a part of the solution. The same will be true for building 36,000 new units of affordable housing. The same will be true for improving the number of high quality high school and middle school seats across the city. BOWSERThe same will be true for how we really change the trajectory for residents in ward seven and eight, who have been underinvested in both in terms of their human needs and in terms of their neighborhood needs. And some of those things, the real message I wanted to convey is some of them require trade-offs. You have to give up something to get something else. And those are the questions that we deal with in government every day and we're asking the community to come along with us. SHERWOODThere are lots of subjects that you're dealing with and I want to talk about the overall politics of your relationship with the Council. You won overwhelmingly re-election. So did all the councilmembers who were up. You did attempt to defeat Elissa Silverman in that campaign. She won overwhelmingly. And Elissa Silverman even won ward four. I've talked to a variety of councilmembers all of whom say they all want to work with you on the second term. That they think lots of things can get done, but they still think you're bristle. SHERWOODTwo of them used the word bristle separately. That you still demand your -- you want your way more than comprise. And you said on this show in September that one of the things you learned in your first term was that you would be more willing to reach out to the council members to work for solutions and get passed disagreements. SHERWOODWhere are you with the councilmembers now? With Elissa Silverman specifically since you attempted to defeat her, but with the chairman and with the other members, how can we expect you to work with the Council any differently to get all these done that you have on your plate, which is a huge plate? SHERWOODAnd how they approach you. BOWSERWell, I haven't heard you talk as much about that, but that's fine. My approach with anything is to let people know where I stand. I hear from them and then move in a way that I think is best for the people of the District of Columbia. Quite frankly that's how I see the members of the Council approach their work too. And I do all that I can to persuade them to my point of view. BOWSERAnd they sometimes try to persuade me to their point of view. And at the end of the day, both of our jobs, from the executive and the legislature is to come up with the best public policy for the people of the District. What's good about our city is probably we agree on 99.1 percent of the things. I think our values -- when I talk to members of the Council are almost universally shared. And sometimes we disagree about how to get there, but I don't think that we approach it with animosity. SHERWOODIt's not personal. It's politics and public policy. SHERWOODOkay. Good. I hear very things. They do say good things. I assent and I hear it and I also sense it that they in fact do want to work together and I hear the same thing from you. There's just so many things now facing the city. BOWSERThere are a lot of things facing the city. And one of the things that we've been tested by in the last three weeks is the federal government shutdown. Now I'm proud and many mayors before me and members of the Council should be proud that our city is resilient. And we're better able to deal with this uncertainty from the federal government than we ever have been. But we are being tested. Our people are being tested. BOWSEROne, two, three paychecks gone will test any family's ability to pay their bills. And so that's a true test for us. I think that we also have to be prepared for the future test. And that's if this economy takes a downturn and we have to deal with a recession. I've served in this government during the 2007-2008 recession. It was a tough time for the District. And I also reminded members of the Council that we have to think about that and that we shouldn't be writing checks that we won't be able to cash in a recession. And so those are things that as I approach my second term that I will continue to talk to my fellow elected officials about. NNAMDIPeople who are calling in and tweeting in want to discuss very specific issues. Here is Greg in northwest Washington. Greg, you're on the air. Go ahead, please. GREGThank you very much, Kojo. Hi, Mayor Bowser. GREGI'm glad, actually, Tom, that you raised the issue of the relationship with the Council. And mayor you said that you make your point of view known, but one thing that I've seen you do with the (unintelligible), which passed the Council unanimously in 2016, you have refused to implement it. You have refused to follow the law. And this is comprehensive public health approach to public safety and came about 2015 after an uptick in homicides. GREGWe're seeing the same thing now. And I want to hear why you haven't committed to this public health approach? Why you seem to be doubling down on policing and punishment? What evidence you have that that approach works and will you make a commitment to expand these lifesaving approaches? NNAMDIGreg, I have a question for you. NNAMDIWhy did tell our call screener that you wanted to ask about the Metro fair evasion decriminalization act? GREGI do want to ask about that as well. NNAMDIOkay. Well, let's -- I'll let the mayor answer your first question, because we have a tweet about the second. BOWSERSo I think Greg seems to not be following all of the work that we have done in creating our Office of Neighborhood Safety and Engagement, which was the central tenant of the NEAR Act, which was offered by Councilmember McDuffie where we have hired a well lauded director of that office. We have put grant funds out in communities to hire violence interrupters and are really pushing and hoping and making sure that this office has the resources that it needs to interrupt some of the violence that we are seeing in our streets. BOWSERNow as I recall there are like 17 different tenants. I think we have already implemented a majority of the tenants of the NEAR Act. But I think people need to very careful, as I said when we passed the NEAR Act, that there is no one single solution to preventing violence. And we have to make sure that we're hitting all of those, violence interruption and conflict mitigation, creating opportunities, which we have done and we will continue to do so that we are getting more people in jobs and out of the cycle of criminal activity. BOWSERBut enforcement is also part of it. If you are a victim of crime, if you live in a neighborhood that is plagued by crime, the last thing you want is to not have police presence in those neighborhoods. And so we will continue to focus on enforcement and prosecution of violent acts in our city. It's also key to putting an end to an uptick in crime. NNAMDIAnd you should know that if you had told us what you intended to ask, we would you have let you on anyway. So in future and for everyone, please, just be -- tell the truth to our call screener. And since he raised that issue, I'd like to raise the issue that I thought he would raise. And we got a tweet from the ACLU of D.C. saying, "Please, ask Mayor Bowser why she thinks people should be arrested and jailed for not being able to pay Metro fare. Is that D.C. values?" NNAMDIWell, I guess what they're talking about is this week you issued your second ever veto of a council bill. You sent the legislation that decriminalized Metro fare jumping back to the Council saying it would encourage fare evasion, and lawlessness. Why did you use your veto power on this? BOWSERI fundamentally disagree with the premise that some people should pay Metro and some people shouldn't. We have a Metro system that has a system of rules. It has fares. And we should expect everybody to abide by the rules of the system. And I also believe that lawlessness begets lawlessness. And the last thing we want to see is our system descend into a system where people are scared to ride it. BOWSERAfter all, there are many people who use Metro by choice. They use it to commute. They use it to go visit their friends, to go to monuments and memorials. And for a lot of people in our city, Metro is their lifeline. It is the only way that they can travel to work and to pay their bills. And so I have a sincere interest in making sure that we maintain a safe Metro system. But let me also say, Kojo, there's nobody that has done more for free Metro fares for D.C. residents than I have. NNAMDIDid you pay to come over here on Metro today? BOWSERThere is no one, let me repeat, who has done more for free Metro for D.C. residents then I have. When I was a member of the Council, I started a program called Kids Ride Free. And it allows every school age child to ride the Metro free. We've improved that. We've expanded it to the subway. We've expanded it to our summer youth employees. We've expanded it I think through Council action to also job seekers. And so I would challenge people not to say to our residents, you don’t have to follow the law. But let's say to challenge all of us to think about how we can target subsidies that make sense to residents that need it. NNAMDIWhat your critics are saying is that specifically Councilmember Trayon White when he introduced the bill saying that 91 percent of criminal citations for fare evasion are given to African Americans. And so the critique is that it disproportionally affects black Washingtonians and criminalizes people who should not be considered criminals. BOWSERWell, I could only say it's disproportionate if I knew that the total of offenses. And so if we're saying that -- and I don't know that anyone has provided that information of who are the fare evaders. So I think the better question is how can we target our subsidy programs toward people who need it. SHERWOODWell, Metro's own fare evading on the bus. They keep records of that and I think that's where some of those statistics come from. I talked to Charles Allen this morning from the D.C. Council and he says the problem with criminally arresting people and they do have statistics. They do arrest people is that -- for it -- and principally African Americans. NNAMDIAs far as they know, has anybody ever been prosecuted for it? Not as far as I know. NNAMDIYou now have a criminal record. SHERWOODYou have a criminal record, which is an issue. BOWSERWell, speaking of that. Arrest records and other records that can be sealed or expunged, we have a bill on the Council in the committee on the judiciary that will deal with that, not only for fare evaders, but for other people who have had an interaction with the courts or with the police. It's an important bill for the District. And so what I think that all of our attention would be better spent on how we can have a comprehensive record sealing bill and get it out of the Council. SHERWOODI asked Mr. Allen about that also and he said part of that problem is that it's better to upfront not charge someone than to rather than make them through the process of having a lawyer and trying to have their record expunged or even have it done by the city. BOWSERWell, I have to say, Tom, what's really poor policy making is when you create laws that are totally unenforceable. And you put the people, who are in charge with public safety in the quandary of not knowing how to do their jobs. And that's what the current bill before -- that the Council has passed does. They pass a civil infraction and there's no enforcement mechanism for it. Our own attorney general's criminal division has said that as well. BOWSERAnd so there may be ways to fix it to introduce instead of this ticket a summons that requires the person, who has evaded the fare to go to court. But the way it is now is unenforceable for out law enforcement. And this is what happens. And this is my concern. When you tell police officers and when you tell the station managers, your experience in doing your job doesn't matter because we have told everybody you don't have to pay. Then they begin not to care. BOWSERAnd when you have personnel down in those conditions that feel like they can't do their jobs and the system has run amuck. Then that's bad for everybody. That's not just bad, you know, I appreciate caring about not having people have arrested records who have evaded the fare, I appreciate that, but I think there's a more targeted way to deal with it. NNAMDII want to remind everyone we are not about halfway through the show. We have not yet talked about affordable housing. We haven't talked about education. We haven't talked about traffic congestion. We haven't talked about a lot of things. And there are callers too. So everyone, please, try to keep your remarks as brief as possible. SHERWOODI want to summarize this, the Councilmember Allen says, that the Council on Tuesday will override your veto and that will go into effect. He and some others also suggested that as the leader of the city you also had to be aware of what Maryland and Virginia Metro, none of whom like this law, and so you're trying to represent -- you had to keep good relations with all of them and object to it. SHERWOODAnd he also suggested to me, he says, The Metro had a (word?) pilot program where they changed the fare gates, which are awfully small and changed them ever slightly, not New York gates, and fare dropped 90 percent, fare evasion. SHERWOOD(overlapping) Well, they all object to the law. NNAMDIHere's a question about affordable housing from Chris, in Washington. Chris, you got us back on track. Go ahead, please. NNAMDIOkay. Got to get to a question. Got to get to a question. CHRIS...we need to get down -- I guess, will you consider, this year, changing that policy to get to DC levels, better yet, Ward-level affordability so we can -- and build more family-sized units? BOWSERI think, Chris, we are interested in any possible solution that will help us get to 36,000 new units by 2025. And I think you know that we have been very focused on 30 percent below FAMI in my four years, where we have gotten over $100 million out of the housing production trust fund every year, which is double what it was when I became mayor every year, and put 6,000 units in the pipeline. BOWSERWe won't be able to meet our goals with our current tools and so we have to think bigger and more creative about how we get more units, and not just in 30 percent and below. I don't want to take away from what we're doing at 30 percent and below. But we also have to figure out how to incentivize workforce housing for people who are teachers and police officers and fire fighters who are working and still need access to units who have -- that have been subsidized. NNAMDIMore specifically, Rene Tweets, given that the mayor says she wants to increase housing affordable to working class people, why does she promote a $56 million TIF for mid-city's development at Brookland Manor, which will result in the reduction of affordable units? BOWSERWe want to continue to build housing in Ward 5 in the number -- in a lot of units in Ward 5. And what we know is that that property, it needs a fresh start. People there need to have investment in that community, come back to that community. And I don't recall, off the top, the number of units that are going to be produced there. SHERWOODYour investment in housing is one of your principle things you've done in the last four years. SHERWOODIs that right? Do I have that right? BOWSERWell, Tom, this is the point that I want to reemphasize, is that I can't go anywhere without people talking to me about affordability. They love what's happening in the city but they are rightly concerned that they won't be able to continue to afford to live here. And so the point is we can't say we want more affordability, we want more housing units, and not do anything differently. I'm telling you, we can produce 6 to 10,000 units in four years with our current tools. But to get to 36,000 units, we're going to need new tools. And so my challenge to everybody is we have to think more aggressively about how we get to those units. BOWSER...couple hundred witnesses that said they want more of an emphasis on affordable housing on one side. On the other side they say, well, whoa, whoa, not in my neighborhood. Don't affect the way my neighborhood looks. So, we have to have a real conversation about how we move our city forward for more units, because you can't say you want more units and then also say you don't want anything to change. NNAMDI(overlapping) Think about moving to Minneapolis. BOWSER...let's start by breaking up the goal, right. Now, guys, this is what I know can work. If we say -- and we break up that 36,000 units and we look across our city to find out where we can have more units, we can set a plan to get there, and we can do it by 2025. NNAMDIWhen the District adopted the Vision Zero program to address pedestrian and cyclist safety, you set a goal to end traffic death by the year 2024. But the number of traffic fatalities in 2018 increased by 13 percent from 2017. What accounts for this, and I know you think the Vision Zero approach needs, if not to change, to be certainly overhauled. You picked Linda Bailey to head the new Vision Zero office, which is opening in March. She's got a lot of experience in transportation policy, helped to implement New York's Vision Zero policy. What do you hope and expect will be done differently? NNAMDI(overlapping) Why is it not working so far? BOWSERWell, let's -- we're talking about any traffic death is troubling. BOWSERAnd we're not talking about increased numbers that are -- we have a small number, so any increase represents a percentage increase, like you mentioned. And so our focus will be how we can make our education efforts more robust so that people aren't distracted when they're driving, so that they slow down and they're not speeding, so that we harden our infrastructure. And some of our infrastructure changes are easy to implement, like the no turn on reds that we will implement across the city. Others would be some of the bollards that we're going to put up around certain intersections, as well. BOWSERAnd some of them are more difficult, because they require changes in the roadway which are multiyear projects. And that's important, too. Now, we also get criticized sometimes because we want to make our fines indicative of our desire to make our roads safer. And, you know, I would make an analogy to the other situation we talked about, but the truth is, you don't have to get a big ticket if you slow down, if you follow the rules. And so, many people are supportive of stiff fines to get the behavior that we want. SHERWOODOne thing is, like, blocking the bike lanes, now $150, which trucks use them as parking spots. NNAMDII knew he'd bring that up. SHERWOOD$500 (all talking at once) if someone blows through a crosswalk. BOWSER...and bike lane blocking are deliveries. And we have increased deliveries, here. I mean, how many times have you called Amazon to deliver to your home or to your business? And so, it's tougher to talk about how we are going to make a better way for those deliveries to happen. NNAMDIOur guest is Maybe Muriel Bowser of the District of Columbia. I haven't said that for a long time (laugh) . SHERWOODThere's no doubt who she is. SHERWOOD...very quickly. Isn't the bottom line that, in a growing city that changed from the 40's and the 50's and before, that we can no longer just be car-centric? That we don't have the space on our public streets for all that private parking, for illegal parking, and that we are -- you are in the process of changing the way the whole District of Columbia moves, and so that we can make accommodation for a growing city? SHERWOOD(overlapping) That's kind of the overall picture. BOWSER...we need to be. We're over 700,000 people in DC now. We've been bigger. We've been 800,000, but the difference is people live, work and play in all different places, not just around the city, but around the region. And we're going to keep growing. We have a robust economy. We have a great quality of life, parks, culture, schools in our city, so we're going to keep attracting people, which is a good thing. But not everyone will be able to drive. SHERWOOD(all talking at once) The era of the private car is over. NNAMDIAn anonymous listener emails, what is she doing to crack down on rental bikes and scooters being ridden on the sidewalks in busy downtown areas? I knew that was coming. BOWSERWell, we (laugh) -- we have -- talk about a disruptive technology that got ahead of us a little bit. And our DDOT is focused on rules that make sense, and we'll keep working with them so that people can ride, and that we can all be safe. I will say that another thing that I introduced at our second term outlook meeting was some changes to our organization. And we are creating a new cluster of agencies, a new deputy mayor's office that focuses on transportation and mobility. So, those folks will work as a team to help deal with our mobility issues. NNAMDIVictor wants to talk about an issue we have discussed on this show, and that is sharing our space with our rodent population. Victor, you're on the air. Go ahead, please. VICTORKojo, thank you, and I love the way you put that, because I do actually feel like I'm sharing it. Mayor Bower, thank you for everything and congratulations on your second term. NNAMDI(overlapping) They're chewing up your wires. VICTOROh, they're chewing them up. I'm figuring the new wires taste good. They're putting out a flavor that, really, the rats love. On a serious note, what are we -- what are the plans for rat abatement, and what can I do? BOWSER(overlapping) What part of the city do you live in, Victor? VICTORI'm actually in Columbia Heights. I'm on the 11th Street corridor, between 11th and Sherman Avenue. BOWSERNow, one of the big strategies that we've used in areas like where you live is working with businesses. We have seen a growth, unfortunately, with restaurants, which is a good thing, but also restaurants that are close to residential areas have produced this problem. We have funded compactor programs, and I've tasked my DPW staff, DOH staff and the Office of Clean City in making sure that we're getting more and more of restaurants to take advantage of compactor programs. Also, how they can store waste inside before putting it out. And we know that that leads to more effective treatment. BOWSERBut I would also be interested in your calling our office so that we can -- and you can just dial 311 and ask to be connected to the Ward 1 coordinator in my office to make sure we've done everything that we can on your block. NNAMDII remember when Marion Barry used to run Pride Incorporated, and they had a rat patrol. SHERWOOD...like homicides. Mayor, you've had another spike -- just as in your first year in office, you had a spike in homicides. You've had one now. I was with you on this week -- two days ago? I can't remember. The days run together. North Capitol Street, where you've done one of your -- you did one of your many walks. You've talked about increasing the police force. You opposed an increase when Vince Gray proposed increasing the police force a year ago -- two years ago. BOWSERI've never opposed the increase in the police force. BOWSER(overlapping) It should be difficult to get police officers, just know that. SHERWOOD...and as the chief says, not just in cars. But other than the policing and the long term effects of, you know, more mental health and more intervention, what can you say reassuringly to citizens who are concerned that while these homicides are appearing in certain parts of the city, not all citywide, that people are concerned about it as much as you are at what can -- the hope that it can be addressed properly. BOWSERWell, absolutely, we -- and as I mentioned in one of my earlier responses, preventing crime takes the whole government, the police, but it also take the community. And our communities have been very helpful to us. The chief is very focused on how to best deploy resources, how to get information, how to cooperate with our federal partners and investigations and in prosecutions. And we know when we do all of that from law enforcement, from intelligence-gathering all the way down to getting people in better opportunities, we will drive the spike down. BOWSERBut we cannot -- I cannot leave this conversation without focusing on how we focus on illegal guns and how we focus on repeat violent offenders in our system, because they account for most of the violence. SHERWOODThe chief told me 60 percent of the victims of the shootings, people know each other -- it's not random shootings -- that 93 percent of the rest are people with previous arrest records. And he's also said that we still have about the same number of shootings, 530 to 560 a year, but they are more deadly. Either the guns are more lethal, or people are better shots. So, there are a variety of things to this, just not more homicides. BOWSERThat's correct, and our department, they use data smartly. They used technology in a good way. And we are also -- we have strengthened our responses with a crime lab that is more quickly and better analyzing crime, that has taken guns off the street that have been used in multiple incidences of crime, violent crime throughout the city. And we know that all of those things will help us build the cases that prosecutors can get results from. The truth is, if people demonstrate to you time and time again that they have a gun and they're willing to use it, we know that we have to get them out of our neighborhoods. NNAMDIMichelle in Northwest DC wants to talk education, but specifically, school safety. Michelle, you're turn. Go. MICHELLEGood afternoon. Thank you, Mayor Bowser, for all your support of the schools here in DC. My daughter goes to high school downtown. I went to an evening meeting this week, and I was really concerned to hear that there's some real basic safety measures lacking in her school. For example, I learned that there's no locks on her door, so that should there be some sort of incident, the teachers are sort of helpless to defend their classrooms. And I heard one problem was that there's not funding to even buy the locks on these doors. So, I wanted to hear from you -- as such an advocate for education and safety -- what can we do to ensure that there's basic safety mechanisms and protocols in our schools? SHERWOODMary (sic), is that exterior locks on the exterior doors you're talking about? BOWSERShe's probably talking about classroom doors. BOWSERNo, not in -- this sounds like a building that hasn't undergone a modernization. I don't know which building you're talking about, Michelle. But, I will say, we have recently -- one of our new buildings at Boone Elementary School, it's in Ward 8, we have seen a prototype that we're very interested in, that unfortunately, we have to plan for some difficult situations in our schools and churches and synagogues. And so our team at DGS and DCPS, I know, are looking at different technologies like the ones that we've seen implemented at Boone Elementary School that will help us. And I don't even like to say it, but what it is is it helps us harden our system from an active shooter situation. SHERWOODOn Monday, oh, good. He'll have council hearings, two, I think, during the month of February. I guess will he be interim while he's waiting to be approved by the council? BOWSER(overlapping) Well, that's his record, and he has been a classroom teacher and a school leader at every level. He's been a very successful superintendent in a system not exactly like ours, but similar in size and in the type of urban challenges that urban school districts have. And he has been successful in focusing especially on transforming at the high school level. Now, certainly, any change, you know, do I wish we didn't have an interruption a kind of focus? But we did. And we were able to recruit a fantastic superintendent, and I'm looking forward to his leadership. NNAMDIWe only have about four minutes left, so there are a number of issues that people want to address, so, quickly, Adam -- Alan in Adams Morgan, you're on the air. NNAMDI(overlapping) Got it. Mayor Bowser. SHERWOODNo, he -- I know what his question -- I know Al, and his question -- people are afraid that you're going to turn that part of the city over to Dan Snyder, who will build a football stadium and a hotel or other stuff and undercut what people want over there. I think he's asking, what are we going to be doing about RFK? Are you still aggressively trying to get a team there? BOWSER(overlapping) I'm still aggressively trying to get it, as I have been from day one, to get control of the site, because I knew we would be at this day. And this day is that we're no longer using the stadium itself. We built our own stadium. Our soccer team has moved, and now we just have 100 and, I don't know, 50 acres, I think, of asphalt, and a dilapidated building that has the name of an American hero on it. And that's not a position you want to be in as the DC mayor. SHERWOODEverything that the people who live in that area would need or want can be accommodated. Then we can have a discussion about the team coming here, its name, and how it would fit in or not fit in. BOWSERRight. And what I've said from the beginning, Tom, is first things first. We've got to get the land. Without the land, that discussion is moot. NNAMDIHealthcare east of the river. Here's Connie, in Silver Spring. Connie, go. NNAMDIWe only have about a minute-and-a-half left, so allow me to have the mayor respond. SHERWOODI'll give you some credit, here. We've had snow this week. We might get some more snow this week. NNAMDIJohn emails, how do you expect people who don't shovel their walkways and stairs to obey the shoveling laws when the fine is $25 for residential, but it costs 35 to 50 to hire someone to shovel? BOWSER(overlapping) Mm-hmm. I take this approach to snow. I think it's my job to get the city open, no matter how much it snows. And so that's kind of the charge that I give my team. How do we get Metro open? How do we get schools open? How do we get hospitals -- access to hospitals open? And we just start with that, and we work really tough. I have a great snow team. They did a wonderful job this week. NNAMDIMuriel Bowser is the mayor of Washington, DC. NNAMDIThank you so much for joining us. BOWSERThank you, Kojo. Thank you, Tom. NNAMDITom Sherwood is our resident analyst. Today's Politics Hour was produced by Mark Gunnery. Coming up this Monday, we'll talk to local educators about unique ways they've taught the civil rights movement and Martin Luther King, Junior's legacy. Plus, with the shutdown affecting favorite Smithsonian sites, we talk with WAMU's arts reporter about where you can go to reflect on the life of Dr. King. NNAMDIFor my 20th Anniversary year on air at WAMU, I've been popping up around the Washington region to hear what you have to say about the issues you care about. In case you missed it, check out the video of me interviewing street musicians at Gallery Place Chinatown. You can find that at KojoShow.org/blog. And thank you all for listening. Any special plans this weekend, Tom? SHERWOODAvoid the snow, if there is any. NNAMDIHopefully none. Thank you for listening. I'm Kojo Nnamdi.